With over 3000 kilometers of coastline, pristine beaches, dynamic growing cities, mountainous highlands, and diverse cultural and historic sites, Vietnam’s tourism industry continues to rank amongst the fastest-growing tourist destinations in the world, with revenue in 2018 reaching VND620 trillion (US$26.75 billion), up VND110 billion (US$4.75 billion) compared to 2017. Since 2010, the number of international tourists has grown three-fold from 5 million to more than 15 million in 2018. In 2018, international arrivals to Vietnam reached 15.5 million, up 2.7 million compared to 2017, while domestic tourists grew by 6.8 million compared to 2017, to an estimated 80 million in 2018. Visitors coming by airways increased by 14.4 percent in 2018, while arrivals by road increased by almost 60 percent, and by seaway decreased by 16.8 percent. Vietnam, recently named the “Asia’s Leading Destination” for the first time at the 2018 World Travel Awards, offers a variety of options for tourists such as cultural and historical tours, sea-based tours, adventure tours, eco-tours, and luxurious vacations. In 2018, Ho Chi Minh City led among all the cities and provinces with 36.5 million visitors, which included 7.5 million international and 29 million domestic visitors. Hanoi, the capital, attracted 28 million tourists, including 5.5 million international tourists. Both cities also recently featured amongst the top 10 most dynamic growing cities in the world in JLL’s Short-Term City Momentum Index (CMI) 2019. Quang Ninh, a northeastern coastal province, emerged as one of the new destinations in 2018, attracting 12.5 million tourists, including 5.3 million international visitors. In addition, Da Nang, one of the largest city in Vietnam attracted 7.7 million tourists, including three million international tourists. Other major destinations include Hoi An, a well preserved historical trading port and Phu Quoc, the largest island in Vietnam. In 2018, the number of visitors from Asia increased by 23.7 percent compared to 2017 to 12.1 million. China accounted for the majority at 4.96 million, up 23.9 percent, while the number of South Korean visitors increased the highest at 44.3 percent compared to 2017 to 3.48 million. Visitors from Europe and America increased by 8.1 percent and 10.6 percent, to 2.1 million and 903,800 respectively. Tourists from Australia increased by only four percent in 2018 to 437,800, while inbound tourists from Africa witnessed a growth of 19.2 percent to 42,800. The number of visitors from only two countries witnessed a decline in 2018. Cambodia and Laos, both neighboring countries witnessed a decline of 8.8 percent and 15.2 percent respectively. According to the Vietnam National Administration of Tourism (VNAT), foreign visitors on an average spend $900 on a trip to Vietnam, compared to US$1,105, US$1,109 and US$1,565 spent in Singapore, Indonesia, and Thailand respectively. Unlike Singapore and Malaysia, Vietnam’s tourism industry has been unable to develop its infrastructure in line with the rapid growth in the tourism industry and establish itself as a shopping destination or a hub for nightlife activities, which has an impact on its revenue. 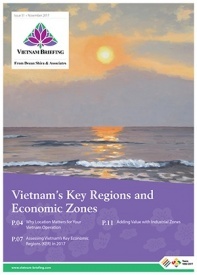 In early 2011, the Vietnamese government released the “Strategy on Vietnam’s tourism development until 2020, vision to 2030”, on developing the tourism industry as a major driver of economic growth. The plan focuses on training professionals, market development, branding strategies, infrastructure development, and developing tourism products and services with local cultural characteristics. Recently in 2017, the Prime Minister approved Decision 1861/QD-TTg (“Decision 1861”), a VND30 trillion (US$1.32 billion) program to develop tourism and transport infrastructure at major tourist destinations mentioned in the “Strategy on Vietnam’s tourism development until 2020, vision to 2030”. Poor provinces that are major tourist attractions will be given priority as most of their budgets are unable to meet the investment requirements for infrastructure development. Along with Decision 1861, the government also approved the establishment of a VND300 billion (US$12.9 million) tourism development fund for promotional activities and building plans. In addition to funding activities, the government has also relaxed visa policies by extending their existing policy of allowing visitors from 46 countries, including China, Japan, South Korea, the US, and the UK, to enter Vietnam for 30 days with a single-entry electronic visa until 2021. The number of international tourists in Vietnam increased three-fold from just five million in 2010 to 15 million by 2018. 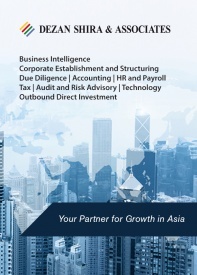 Despite this rapid growth, there is room for further expansion in the sector, which is currently restrained by issues such as infrastructure, human resources, airport capacity, and branding. To ensure that the tourism industry achieves its full potential, the government needs to focus on infrastructure development, including airports and accommodation. Investments in airport infrastructure are slow compared to neighboring countries such as Thailand, Malaysia, and Singapore, forcing airports to operate at a higher capacity than their design capacities. In addition, almost all the hotels in Ho Chi Minh City and Hanoi operate at full capacity, while newer destinations such as Da Nang and Phu Quoc have limited number of accommodation facilities to cater to the growing number of tourists. 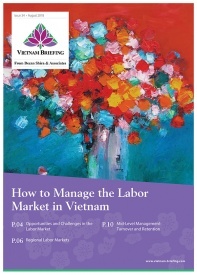 The tourism labor productivity in Vietnam is VND77 million (US$3,297) per worker, which is around 40 percent and 45 percent of Thailand’s and Malaysia’s productivity, respectively. The Philippines is the only country in the region with slightly lower productivity than Vietnam. The tourism industry has developed so rapidly in the last few years, that qualified labor has been unable to serve the growing number of tourists. Tourism schools in Vietnam account for only 60 percent of the industry’s demand, which has led to a shortage of qualified workers. The country has more than 14,800 international and 8,600 domestic guides, with most of them based out of only the major tourist destinations. The ratio between the number of tourists and guides in Vietnam is almost double the international average. The reason for such a shortage of qualified labor is the quality of training. After graduation, majority of the tourism professionals still need to go through months of professional training conducted by the enterprises. The government needs to work closely with employers, training providers, and industry experts to develop training courses and qualification standards more in line with international industry practice. Training tools need to focus on developing proficiency in foreign languages, soft skills, technical skills, and professionalism to meet the growing demand of tourism professionals. In addition to infrastructure and labor, the government also needs to develop tourism products, conduct international marketing campaigns, and build brand awareness to increase revenue. Spending in Vietnam continues to be one of the lowest in the region, unlike Malaysia and Singapore which are promoted as shopping, leisure, or entertainment destinations. Vietnam has the opportunity to rebrand itself by tapping into its rich cultural and historical heritage and diverse geography with unique landscapes. In 2019, the country expects to attract 103 million visitors, including 18 million foreign and 85 million domestic visitors, an increase of 15 and six percent respectively, compared to 2018. By 2025, the government aims to generate US$45 billion in revenue from the tourism industry, increase the sector’s contribution to the GDP to over 10 percent, and account for over six million direct and indirect jobs. Based on the growth trajectory, the targets seems achievable but would require the government to increase public funding in infrastructure, labor quality, marketing campaigns, and brand awareness to ensure that the tourism industry reaches its full potential.